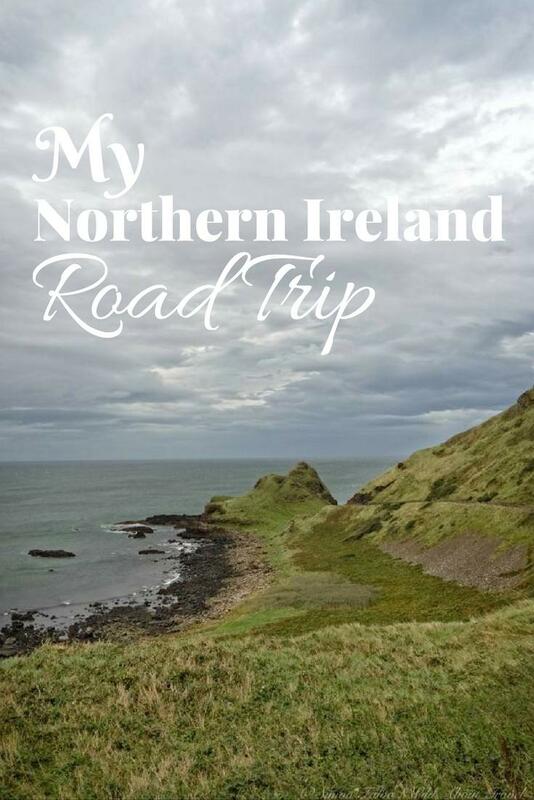 If you missed it, I suggest you read as well the first part of my wonderful road trip in Northern Ireland along the Causeway Coastal Route. I reached the Causeway Hotel late in the afternoon, after countless stops to take photos and admire the views of a scenery that seemed to get better and better as I drove. 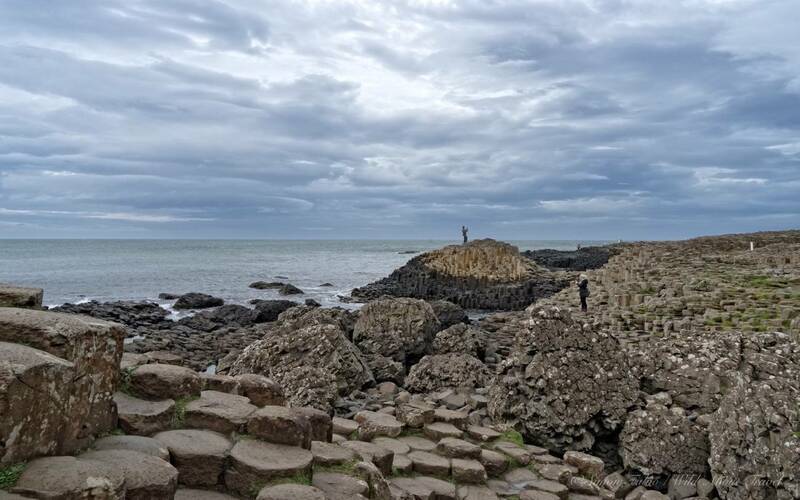 Strategically located a stone throw from the beginning of the path leading to the Giant’s Causeway, it’s a perfect choice if you want to easily walk to this incredible UNESCO World Heritage Site at sunset and sunrise. I was so keen to see the changing colors of the Giant’s Causeway at sunset that I quickly checked in and soon went out for a walk. By that time, a strong wind swept the coast and ominous clouds covered the sky like a gray blanket. The gusts were so powerful that they pushed me forward (and walking back to the hotel, against them, was sometimes a challenge), reminding me of Patagonia, where the wind was particularly strong when I visited the mighty Perito Moreno glacier and when I hiked in Los Glaciares National Park. 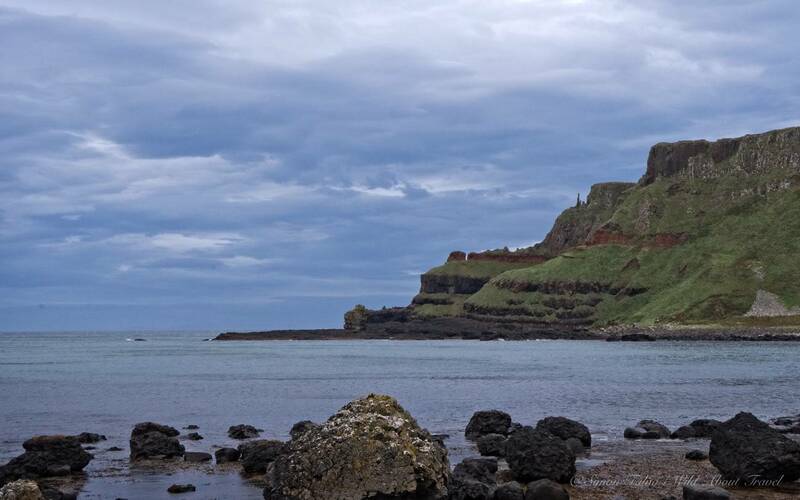 I walked down to the Giant’s Causeway, still hoping the weather might change before the sun would set down. This was not meant to be, though, and the sky kept being so overcast that I couldn’t see the sunset. Notwithstanding, it was a magic moment. 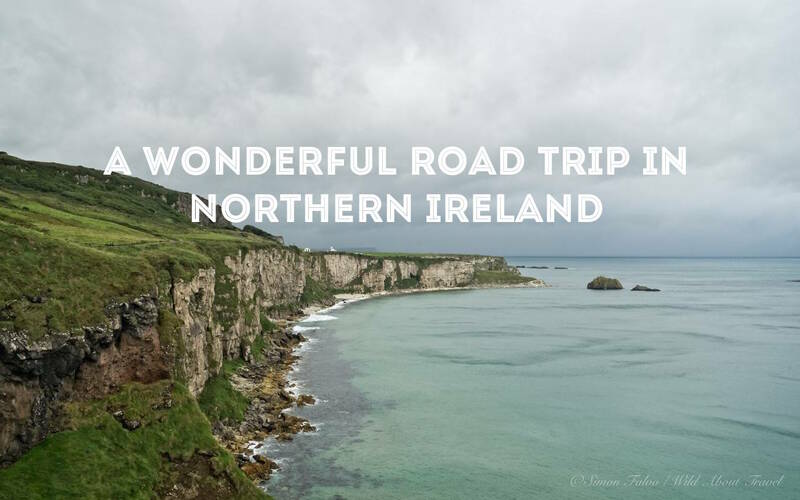 If you’re an independent traveler, you’ll love a road trip in Northern Ireland! 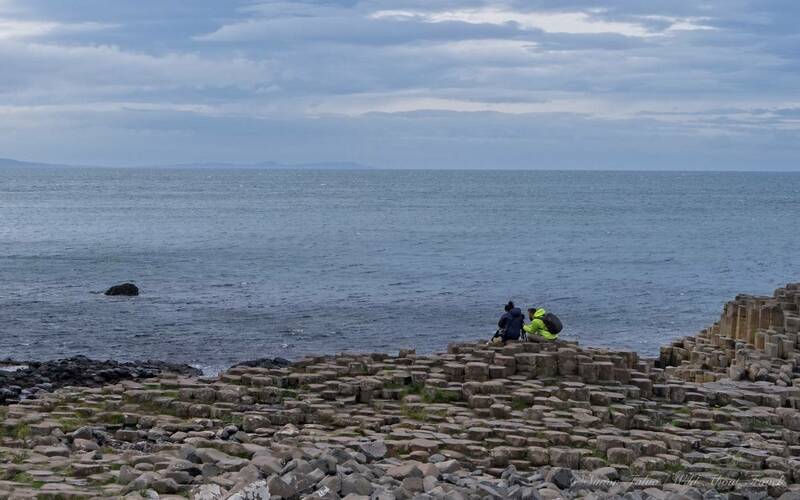 I watched in awe the polygonal basalt columns (there are about 40,000 and they date back to 50-60 million years ago) emerging from the sea, as the blue hour approached. I felt amazed in front of such nature perfection. Struggling against the wind, I walked back to the hotel for dinner and an early sleep, to give it another try at sunrise. No luck either the following morning. The wind was even stronger and it started to rain. The best thing to do was having a good English breakfast and crossing fingers for the weather to get at least a little better. My wish was granted, if only for a little while, and as soon as I spotted a glimmer of sunset through the clouds I quickly got in the car and headed toward Carrick-a-Rede. 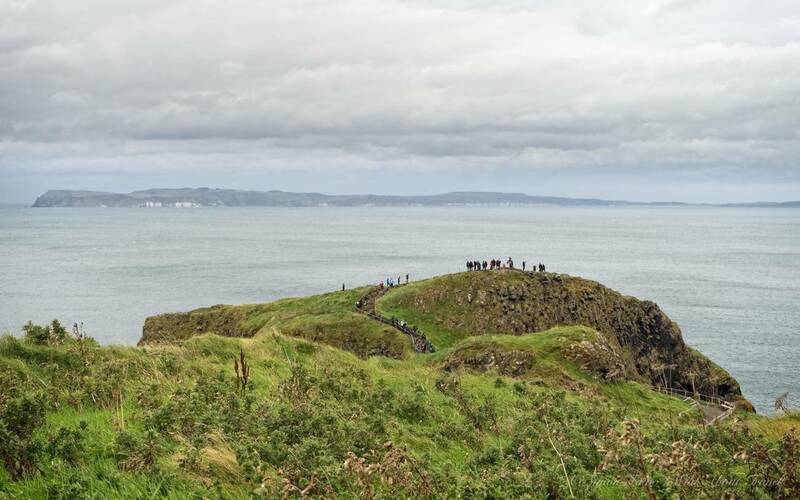 Once a flourishing spot for salmon fishing, the first rope bridge was built in 1755 to connect the small Carrick-a-Rede island and ease fishermen’s work. Salmon fishing steadily declined from the 1960s onwards and the activity stopped at the turn of the 21st Century. 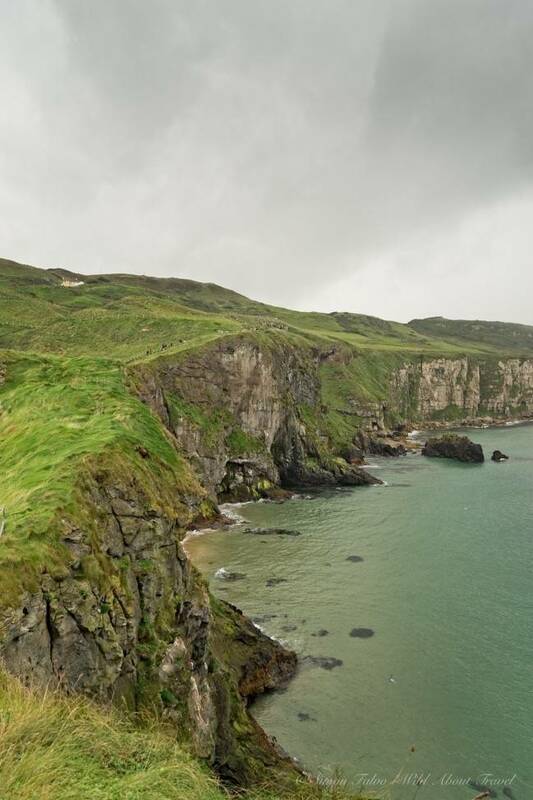 The new rope bridge was opened in 2008 and since then Carrick-a-Rede has become one of the most popular attractions in Northern Ireland. The bridge itself did not really strike me – as it happened with the suspended bridge at Les Diablerets glacier – but the path leading to the bridge is lovely and the scenery took my breath away. Once again, I was mesmerized by the light and the colors: small rocky islands that seemed like floating on the water, the shades of the sea and the emerald green grass on the top of the cliffs. 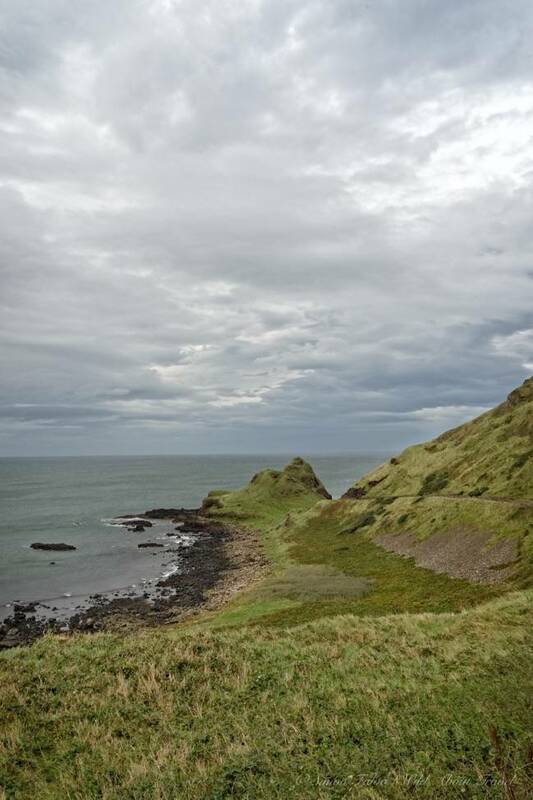 As I walked on Carrick Island, the sky became darker and darker, and I knew that it would soon start raining. I had not even finished thinking about it that it started to pour copiously, and since there is no shelter along the path I reached the car totally drenched. The weather was so bad that I headed directly to the Bushmills Inn, my new hotel for the night. Cozy and with a lot of character, the four stars Bushmills Inn is my kind of place and while it was raining dogs and cats, I had a wonderful time chilling out in my beautiful oversized room, having a long hot bath, and reading a book on the comfy couch. Late in the afternoon the rain eventually stopped and a ray of sunshine came in through the clouds, which opened up like a curtain to reveal a large portion of the sky. Would I be treated to a beautiful sunset on my last night in Northern Ireland? 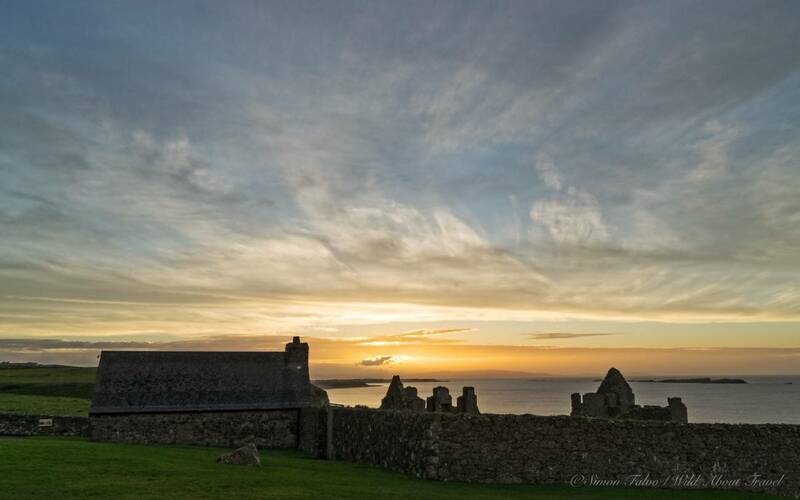 It was too late to drive back to the Giant’s Causeway, so I went to Dunluce Castle and arrived just in time, as the clouds were turning orange. After a few minutes, I was there alone, admiring the sky on fire as if nature had put on a wonderful show only for me. The day ended with a delicious dinner at the beautiful – and very popular – restaurant of the Bushmills Inn, where they serve excellent dishes lovely prepared with local ingredients. I had delicious oysters as a starter and ate a good fish as the main course, washed down with a glass of white wine. If you're looking for a special place, I suggest you to stay at the Bushmills Inn. I loved it! A blue sky and the sunshine brightened my last day in Northern Ireland. My flight was late in the afternoon so I could explore a little more of the Causeway Coastal Route before driving back to Belfast. 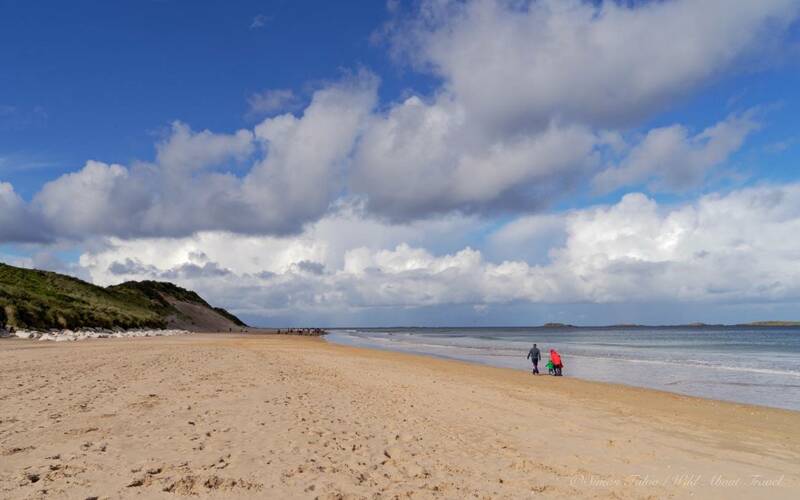 After a generous breakfast, I got in the car and headed to Whiterocks, a beautiful long beach of pale beige sand surrounded by gorgeous white limestone cliffs. As I walked along the beach, I thought how beautiful it would be having a little house on the top of the cliff, with a large window panel overlooking the sea and the wild coast. Clouds started rolling in, announcing that the rain was soon to come. It was anyway time to leave to the airport. 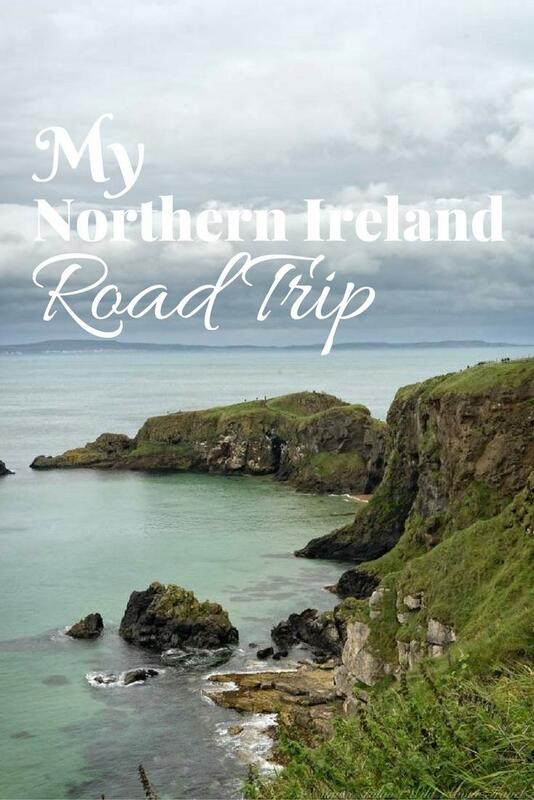 My road trip in Northern Ireland had come to an end, and I drove back to Belfast already feeling a sting of sadness. 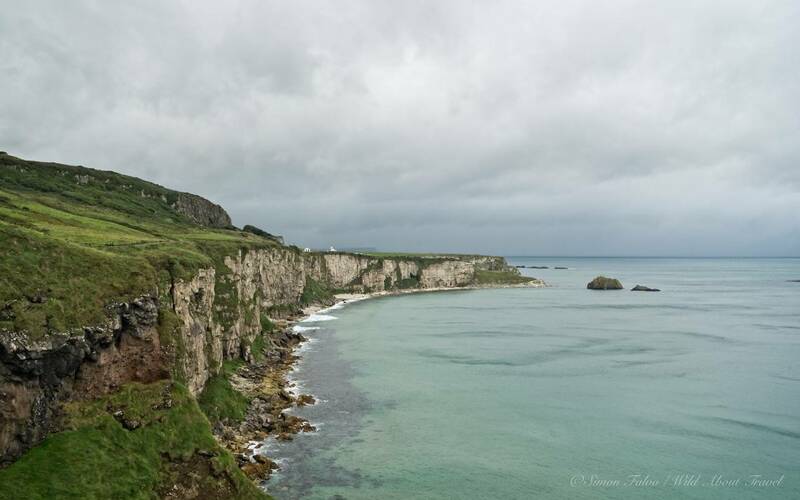 The wild scenery of Northern Ireland and the Causeway Coastal Route caught my heart, and I long to go back soon. Getting there: Belfast is the nearest airport, but you can also reach Northern Ireland from Scotland by ferry. Car hire: Unless you get to Northern Ireland with your own car, you can rent one at Belfast airport, where you can choose between the main car hire companies. If you’re not used to driving on the left, you’ll need some time to get accustomed but it’s not as difficult as I expected. An automatic car certainly helps but be sure to ask for one in advance (apparently, there are not many). Roads: The roads are well kept, but secondary roads can be quite narrow. Drive carefully, especially if you normally drive on the right. 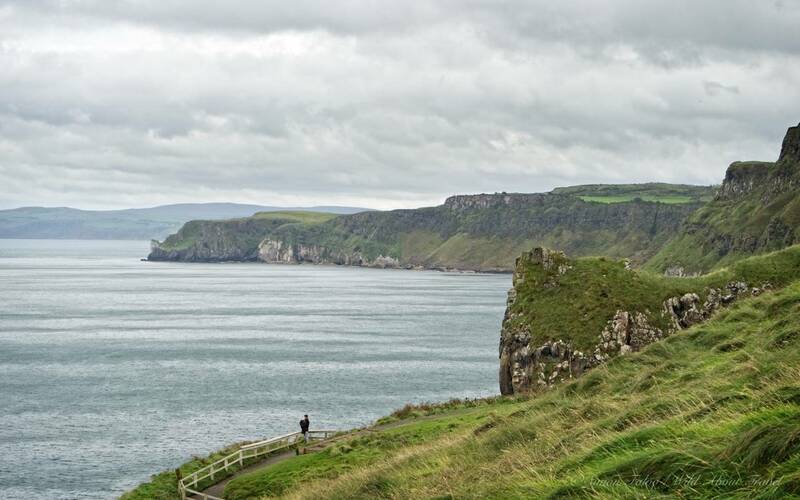 When to go: Weather is often unpredictable so you can visit Northern Ireland all year long. Be prepared for sudden rainfalls and shortly after unexpected sunshine. That’s what makes the light and colors so special. Note: Visit Britain and Tourism Northern Ireland kindly invited me to discover this beautiful region. As always, opinions and awe are mine! 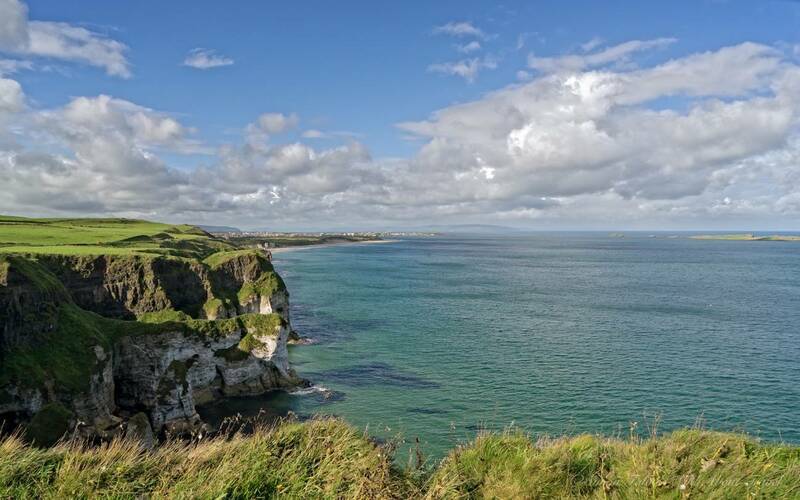 I love the coast of Northern Ireland!